Visitor Visa (also known as Tourist Visa or B2 Visa) is a non-immigrant visa issued to people entering U.S. temporarily for pleasure, tourism, or medical treatment. Who qualifies for USA visitor visa? Any non-US citizen who wants to visit USA for tourism, visiting children, family, friends, relatives, attending special events, family functions, ceremonies, or for medical treatment, can apply for Visitor Visa. Note: Citizens of certain countries may not require Visitor Visa if the trip is less than 90 days. This is known US Visa Waiver Program (VWP). How long can a visitor stay in USA? The length of stay in US will be granted at the the Port of Entry (POE) by the immigration officer based on certain facts they collect from you upon entering US. Usually, stay cannot be more than 6 months. A visitor visa extension of another 6 months can be requested, which is subject to approval. How to obtain Visitor Visa for USA? Getting a Visitor Visa is subject to approval. Each applicant must have a valid passport and must complete a Visa application form, pay the fee, and appear for the visa interview at the nearest applicable US consulate in your country. 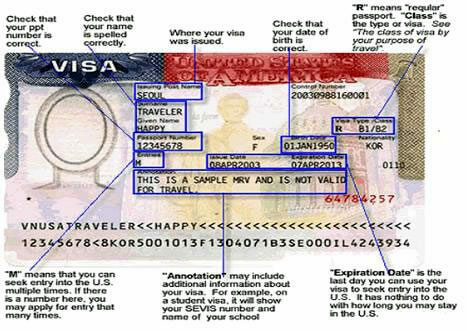 Visitor Visa / tourist visa also known as non-immigrant B1-B2 or B2 visa. Visitor visa is subject to approval. You must apply and get the Visa stamped in your passport. Visitor Visa is granted for a specific purpose only, like tourism, medical treatment, etc. You are not allowed to work in USA on this visa. You can not be involved in any business activities. You cannot study in USA on this visa. Maximum length of stay in USA can be 6 months and subject to grant at the port of entry at US airport on arrival. You may extend the visitor visa for another 6 months by submitting an extension application with USCIS and pay applicable fee. What does US Visitor Visa look like?